Shenzhen Grande Electronic Inc. is a renowned EMS provider. It is capable of doing fine pitch assemblies that have less than 0.5 mm pitch. Grande has been doing BGA soldering for a long time and it offers x-ray inspection for BGA soldering. Grande also does DFM check before sending gerber files to the assembly house which implies that the chances of error on BGA soldering, are none to zero. 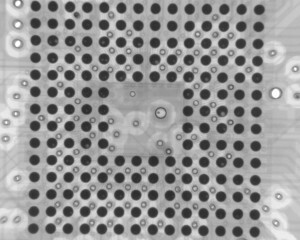 The picture below is an xray of BGA soldering. PCB Fabrication: What are PCB Thickness Options? Why are some people against led street lights? What is your favorite brand of oscilloscope?